There are no substantial coronal holes on the Earth-facing side of the Sun. Image credit: SOHO Extreme UV Telescope. METEOR STORM FORECAST: The Leonid meteors are coming. Where's the best place to be on Nov. 19, 2002, when the storm arrives? Science@NASA has the full story. TWO SPACESHIPS: On Oct. 9th, NASA's space shuttle Atlantis caught up with the International Space Station and docked with it. Amateur astronomer John Locker captured this image of the two spacecraft on Wednesday night when they soared together over his garden in England. He used an 8-inch telecope and an inexpensive digital camera. Click here to learn how you can see the shuttle and the ISS over your own backyard. SUNSPOT WATCH: The Sun is peppered with spots. The largest, active region 139, has a twisted magnetic field that harbors energy for powerful X-class solar flares. 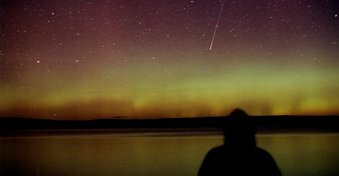 AURORA OUTLOOK: Sky watchers have seen bright and fitful auroras nearly all month. But not today. The chances for strong geomagnetic activity on Oct. 11th are low. Above: On Oct. 8th, photographer Dirk Obudzinski watches a meteor streak through auroras above Yellowstone National Park. You are visitor number 16365720 since January 2000.